The MEA-2 is an equalizer that can provide precise equalization with minimal side-effects – it is designed to provide a very transparent signal path where only the desired equalization effect is obtained without adding any particular sonic signature. The first to appear in the range of Maselec Master Series products, the MEA-2 was developed for Prism Sound by engineer/producer Leif Mases. Leif’s work with a diverse range of artists including Abba, Led Zeppelin, Jeff Beck and Black Sabbath as well as co-ownership of the renowned Marcus Studios in London provided the essential experience using the “tools of the trade” needed to define and implement new and improved professional audio components. The combination of Leif Mases’ experience with the creative process and Prism Sound’s focus on engineering and technical excellence ensure that the Maselec Master Series delivers great-sounding audio in an intuitive and easy-to-use package. 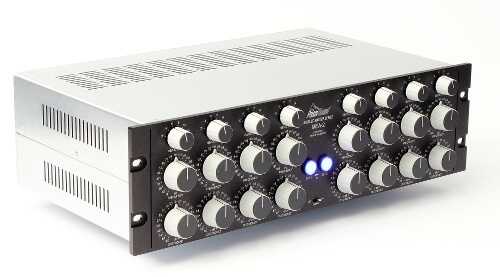 The MEA-2 provides the warmth, punch or air you need with a minimum of effort and without compromising the signal path. There’s no easy way to describe it though, so contact us now to arrange a demo. Great sounding EQ is right behind the controls!